The Tri-Fire Kid's Race is an annual race held within the City of Fairfax that is dedicated to introducing kids to triathlons, teaching them about the sportmanship and teamwork, and promoting nutrition and physical fitness health in an atmosphere of encouragement and fun. 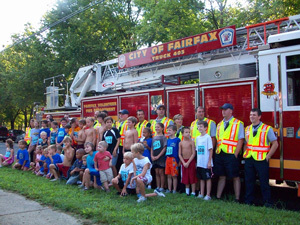 Due to the combined efforts of the IAFF Local 2702, City of Fairfax Fire Department, Mosby Woods Community Pool and many dedicated volunteers this mini triathlon has improved each year and increased in size. 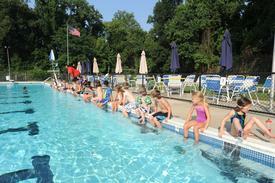 Why encourage kids to partcipate in a triathalon? Triathlons are comprised of three things that almost all kids already do in the summer time: swim, bike and run. The Tri-Fire Kids program shows kids 5-14 years old how to combine them in a way that is challenging and fun while getting great exercise. We believe that by encouraging kids to remain or become active will promote a healthier community, both physically and mentally. 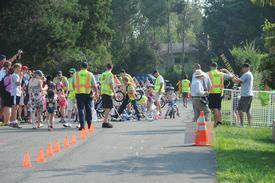 The Tri-Fire Kid’s Race is open to kids ages 5 to 14. 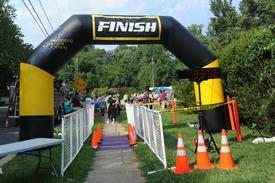 Each participant will join other kids in their age group to complete three events: swim, bike, and run. Distances of each event vary depending on the participant’s age group. This design provides a slight challenge while still encouraging participation in healthy fun activities and building the self-esteem of participants. Yes, there is a small fee to participate in this event. The entry fees of participants cover the cost of lifeguards, race insurance, a participation gift, and medals. Any remaining funds are donated to the City of Fairfax Firefighter’s Benevolent Fund. When is the next Tri-Fire Kid's Race? 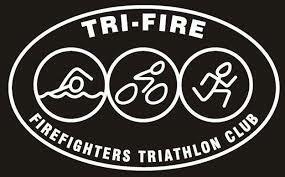 We have not currently scheduled a date for the 2015 Tri-Fire Kid's Race, but do plan to continue this event. If you would like to be notified when this event is scheduled; please e-mail trifirekids@fairfaxfire.org. We are always looking for volunteer’s to assist with this great event. 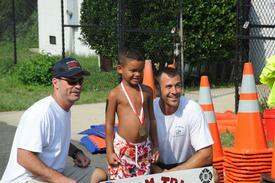 If you are interested in volunteering, please e-mail us at trifirekids@fairfaxfire.org. If you have any questions regarding, please feel free to contact us. We are willing to work with you to help children of all athletic levels have a good time!